Globally, Non Communicable Diseases (NCDs) such as diabetes, stroke, and cancers are major causes of deaths. In Ghana, they accounted for more than 1 in 4 deaths in 2016 according to WHO estimates. Poor quality diet high in salt, sugar and trans-fats are a significant driver of obesity in children and adults, which in turn is a major risk factor for developing several NCDs. Promoting healthier diets – that is, diets which are high in fruits and vegetables and low in sugar, salt, and trans-fats is one of several other interventions to fight these diseases in Ghana. At a seminar held at the Centre for Climate Change and Sustainability Studies, University of Ghana, to share findings of a project aimed at documenting evidence on unhealthy diets and changes in the food environment in Ghana, with stakeholders working in health, Dr. George Atiim, a former research award recipient at International Development Research Centre explained that policies and programmes aimed at promoting healthy eating behaviours and practices ought to at least address people needs and concerns, lest they fail. “Getting people to eat healthier is challenging. People are not only concerned about issues pertaining to availability and affordability; they also need assurances that the food items they purchase particularly fruits and vegetables are safe from the farm to their plates. The research which recorded daily food intake of about 80 people over the course of one week also observes that, sugar-sweetened beverages are a key feature of participants' weekly diets, irrespective of one's socioeconomic levels, though less frequently among those reporting lower incomes. He noted their consumption contributes to overweight and obesity. He called on government and researchers to learn from countries such as Mexico and Brazil and to explore how Ghana can implement fiscal and advertising policies to regulate sugary drinks and junk foods. 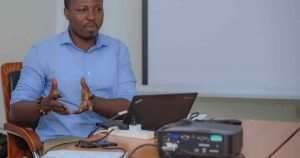 He further noted that, while it is the primary responsibility of government to implement policies to prevent diet-related NCDs from the Ghanaian population, “the journey now and ahead should go beyond the government and involve effective collaboration between civil society, academic, faith-based organization, the media and the citizenry. “Effective collaboration enjoins us to reflect on the challenge of NCDs from a systems perspective. And if we do so, we will find the paths of entry for interventions, with whom and how we ought to collaborate”, he added. The research also found that there is a strong agreement among study participants, particularly stakeholders working in the health sector on interventions recommended by World Health Organization to fight NCDs. Dr. Atiim said “this is good news but we need to among others, help produce the information government and civil society need for action, invest in public education, and provide resources for regulatory agencies for effective monitoring of food industry activities. “There are environmental sustainability concerns. For example, what are the climate change and sustainable development implications of adopting healthy diets for NCDs prevention and control? There are no easy answers here. Researchers from different discipline need to be speaking with each other to find optimum solutions to addressing risks that noncommunicable diseases pose to everyone”. Speaking on behalf of civil society, Mr. Benjamin Anabila, the Executive director of the Institute of Leadership and Development (INSLA) and member of the Ghana NCD Alliance said the problems associated with NCD is cause for national concern and called on government to implement policies and legislation to curb this phenomenon. He called for funding to support INSLA and other CSOs activities on capacity building, education and advocacy for policies that prevents NCDs and protects the lives of Ghanaians. The research was made possible through an award by Canada's International Development Research Centre which supports researchers to advance knowledge, innovation, and solutions to improve the lives of people around the world.